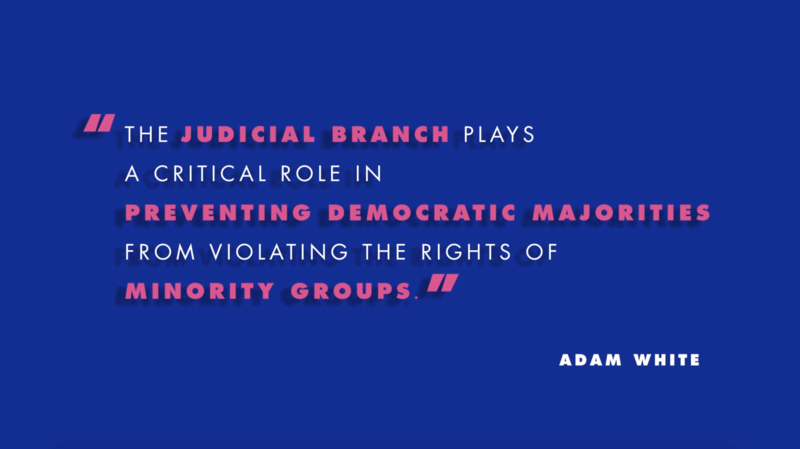 In this video, Adam White is working from one critical question, namely: “How do we entrust part of power in our federal government to unelected officials?” White is referring to the numerous judges and justices that are nominated by the executive branch and confirmed by the legislative branch. They play an important role by limiting executive overreach and preventing the legislature from overstepping their constitutional boundaries. When exercised properly, judicial power can check the excesses of majoritarian government. In a democratic country like the United States, it has often occurred that a majority has sought to impose costs on a minority group or attempted to remove the privileges granted to them by the law. Majoritarian rule means most things are allowed with a majority vote. But the judicial branch’s role is make sure that the universal rights afforded by the Constitution and by the law are not violated. The founders of the Constitution knew that majoritarian rule could overrun the rights of the minority and explicitly called for a judicial remedy. And while they also know that each branch would advocate its own interests and ultimately act as a check and balance against the others, they counted on it to act as a republican remedy, working within the confines of the Constitution.